A feast of activities for kids of all ages – opportunities to get active, creative and most of all have fun. Learn how to print and use a stamp / block print to design your own tote bag using the Paisley Pattern. Get the kids’ creative juices flowing with a fishy masterpiece to be proud of! Poets from Paisley and beyond compete for the £50 prize money and entry to the Scottish Slam Finals in Edinburgh. A special performance of the events surrounding the struggles of Paisley weavers and the payment for the Sma’ Shot. Unique choreography on Abbey Bridge by Right2Dance telling the story of Paisley’s historical relationship with the White Cart River. This year’s burning of the cork has a brand new design that’s not to be missed – have your camera at the ready! An energetic ceilidh for all the family featuring four of Scotland’s finest folk musicians. Scotland’s award-winning swing band performs a mix of swing classics and rock & roll. Clothing, jewellery, accessories, interior design, gifts and souvenirs by some of Scotland’s most innovative designers. 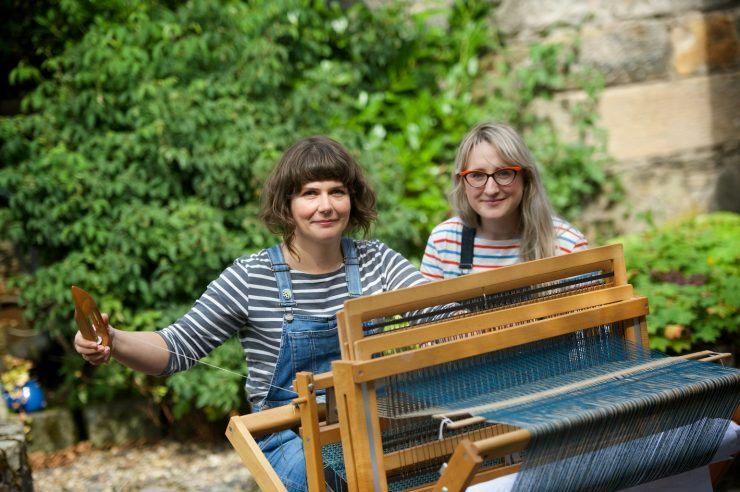 Discover more about the Sma’ Shot story, Paisley’s weaving heritage and the weavers traditional trips ‘doon the watter’ from professional storytellers. Suitable for all ages. Drop in and learn some simple techniques to mend and adapt clothing with designers from Re-Mode. You can also browse and buy from a pop-up rail. Artists in collaboration with community groups, performers and musicians, this year’s parade brings to life the traditional weaver’s holiday and trip ‘doon the watter’. Forget travelling to the seaside this summer – we’re bringing it to you! Enjoy the sandy beach, ice-cream and candyfloss for the kids. Try a trapeze, climb a silk and turn upside down with drop in taster sessions throughout the afternoon. Suitable for all the family – both young and old can come and have a go. Recapture the magic of the seaside with traditional puppet show featuring a cast of colourful characters. An exciting range of bubble themed party tricks and activities. Aerialists will amaze you as they spin and whirl with aerial acts, complete with deckchairs, bunting, beach balls and good old bucket and spades. Go back in time and view weaving demonstrations in the authentic Sma’ Shot Cottages. Drop in to to see weaving demonstrations from Dan Coughlan, curator of textiles at Paisley Museum and Art Galleries. Turn back the clocks to see how weavers worked and lived in the 18th century. Weaving demonstrations with award-winning textile designer and weaver, Mariam Syed. Demonstrations of traditional textile techniques focusing on weaving including spinning and dyeing. Display of woven samples created in community workshops, delivered by the Fashion and Textiles department of Glasgow Clyde College. Celebrate Paisley's rich history of weaving and radicalism, and the famous victory of the town's weavers in the historic sma' shot dispute.